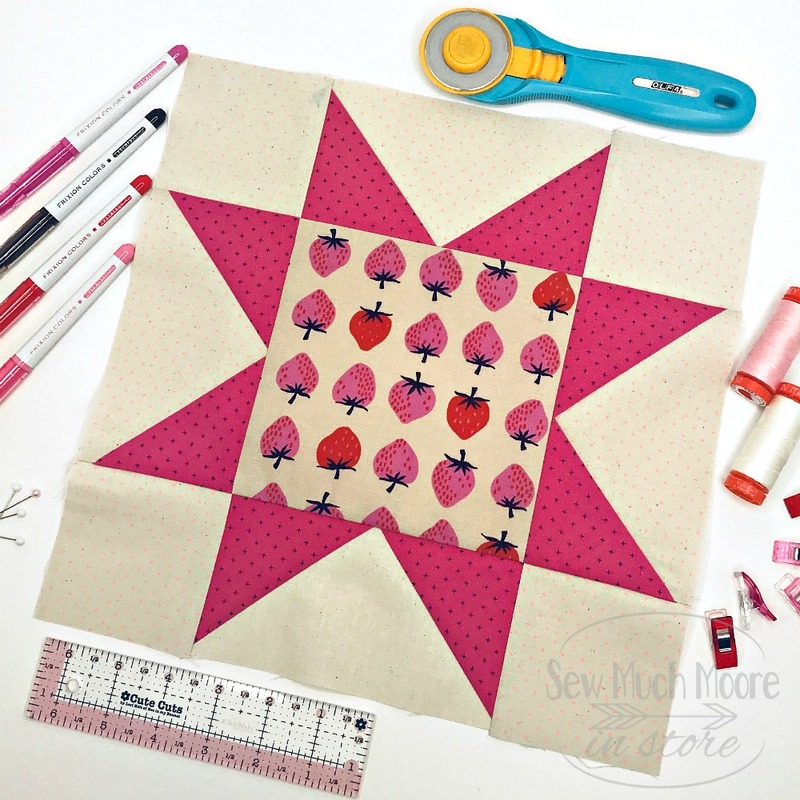 Sarah’s Choice Quilt Block is a wonderful star quilt block. 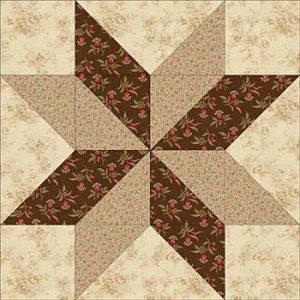 Sarah’s Choice incorporates a lovely pinwheel in the center and can be made in a number of combinations. 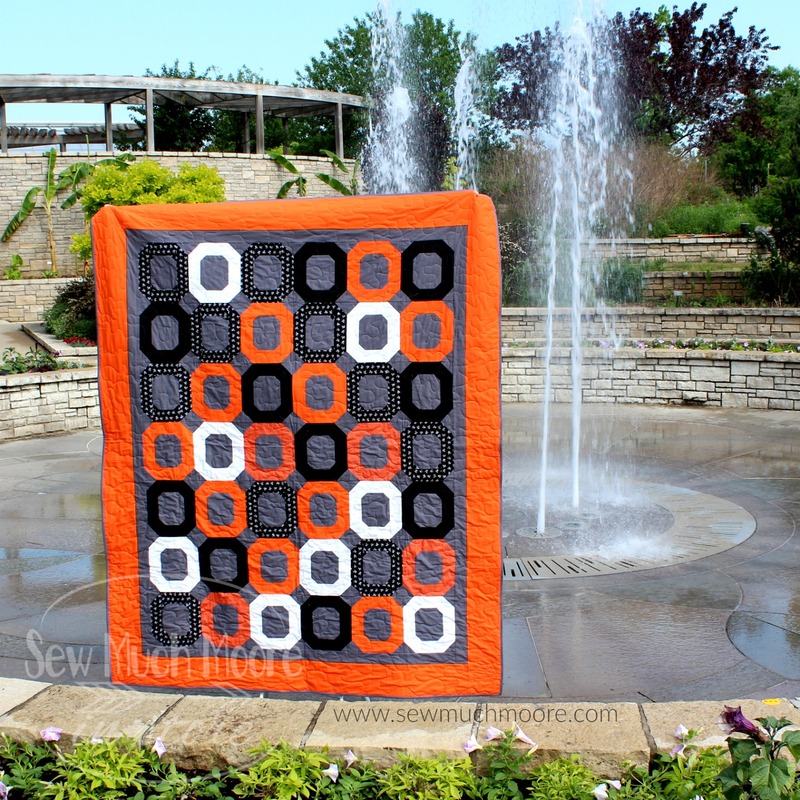 Using squares and half square triangles, this fun and easy block comes together in a breeze! 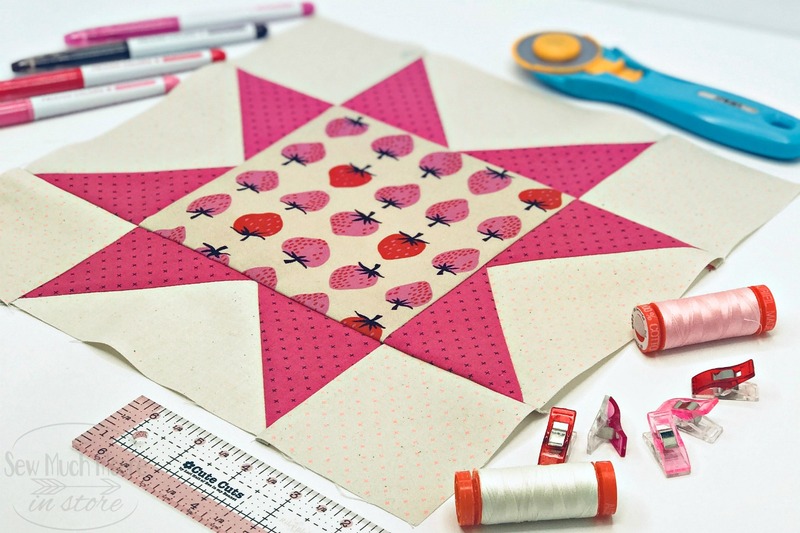 In this picture tutorial, I will show you how to put together this fun and easy quilt block. 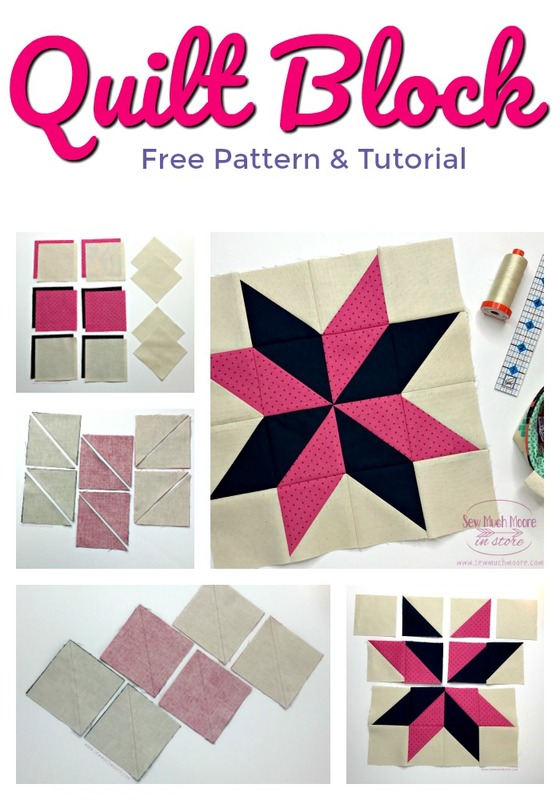 Grab your pattern and let’s get started with Sarah’s Choice Quilt Block Tutorial! 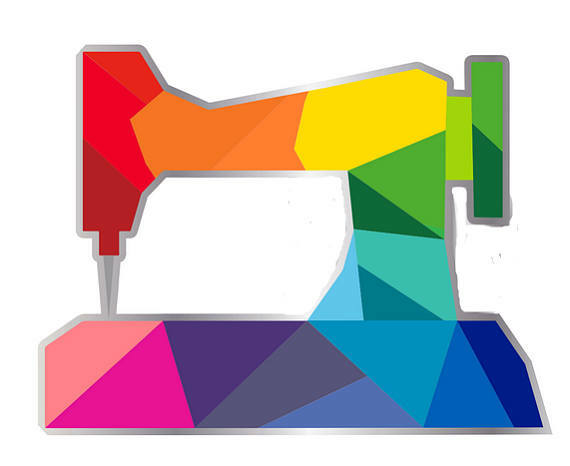 Use this link to purchase the fabric cutting instructions. 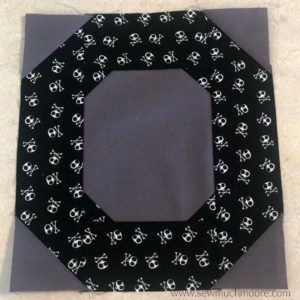 You’ll be emailed a download link for a file that references the instructions in this tutorial and provides the cutting measurements for this pattern. You’ll also be able to download this file in my shop. Iron your fabrics nice and flat to remove any and all wrinkles. Sometimes, I like to spray my fabrics with my favorite spray starch to make it easier to manage. Use your cutting measurements to get your pieces all cut and in order. Using the cutting measurements in your pattern, cut out your background and contrasting fabrics. 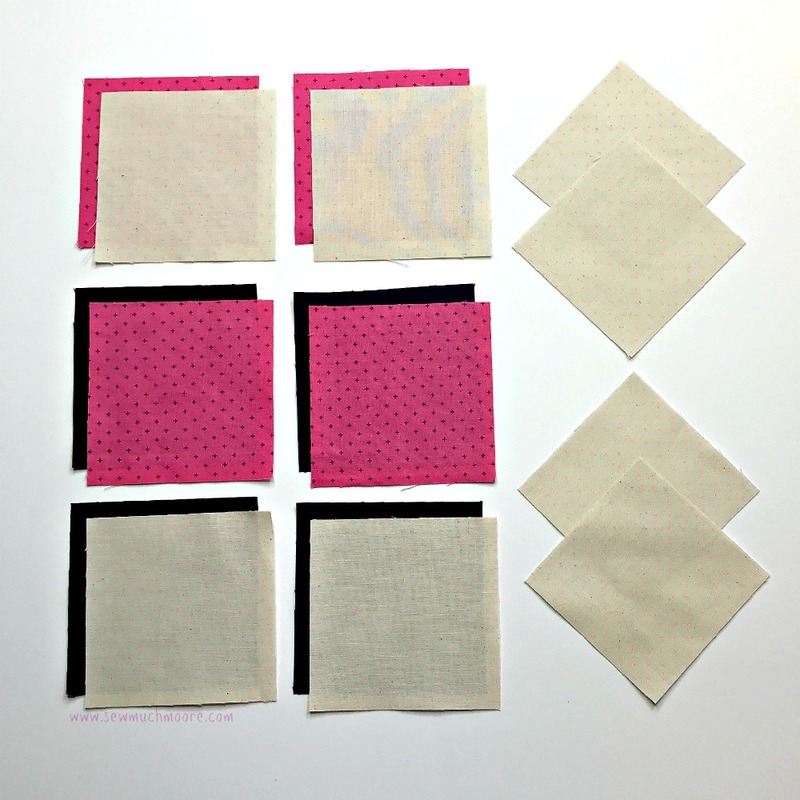 Set your (4) smaller background fabric squares (corners) aside. 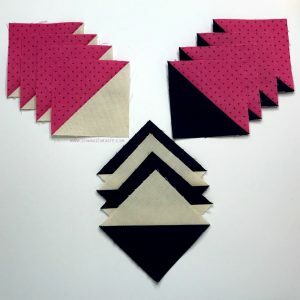 Using a 1/4″ seam allowance, sew 1/4″ on each side of the marked line of each square set. Cut each sewn set along the marked lines. 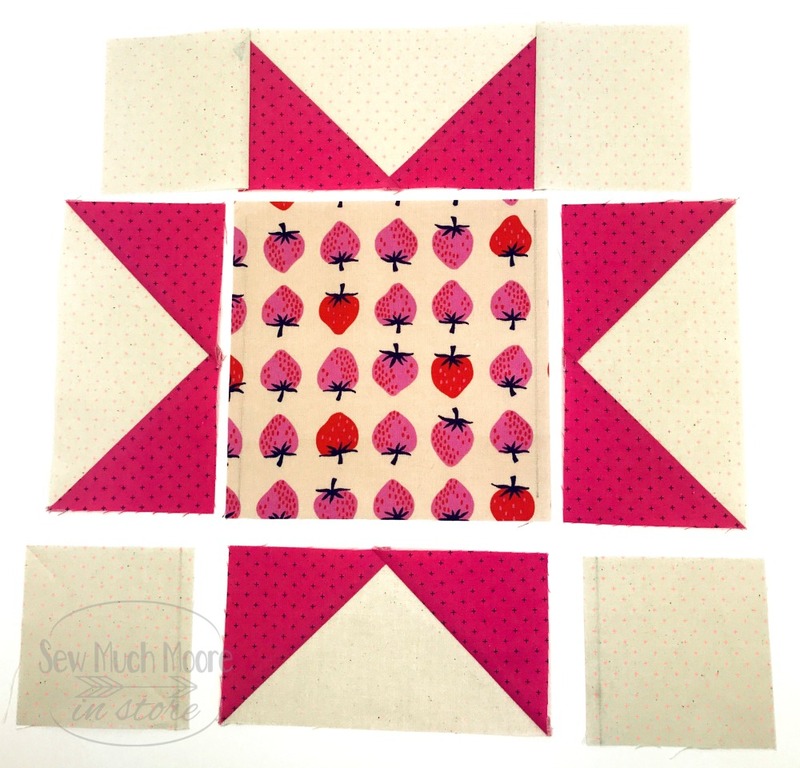 Press each set open and square these blocks to the measurements indicated on your pattern. 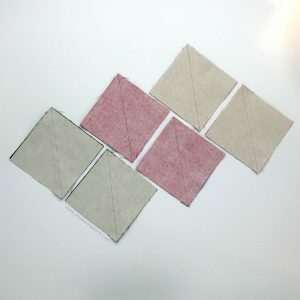 Gather your Background squares (corners) and your sewn half square triangle sets. Line up your pieces, as indicated in the image below. 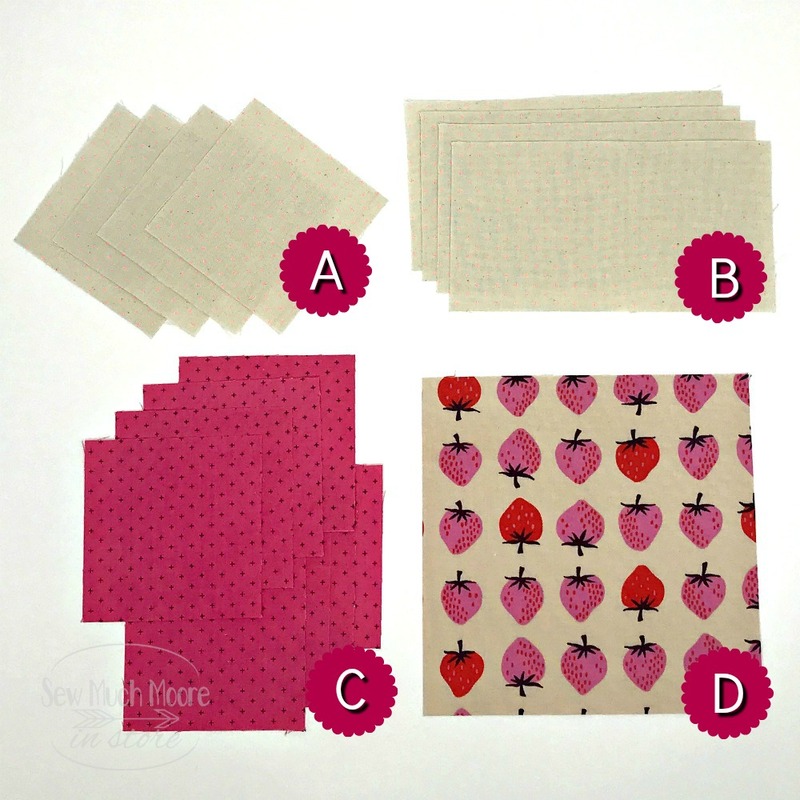 Sew these pieces together, row by row, using a 1/4″ seam allowance. 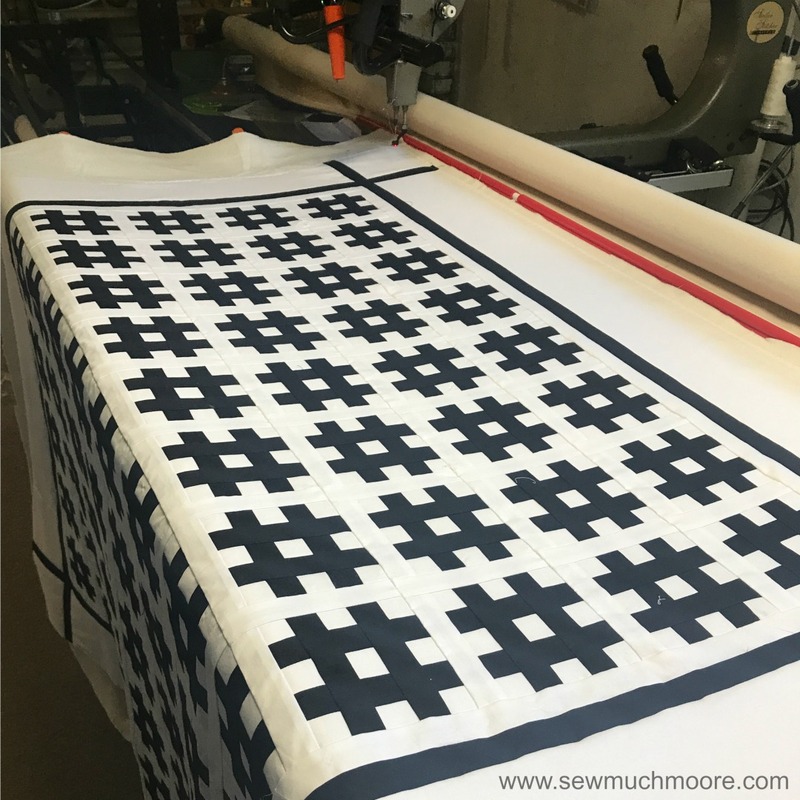 Press each row seams opposite of the last row. This will help you match your points. Simple and Beautiful! Once you have your block assembled, you can square this up to 12.5″. 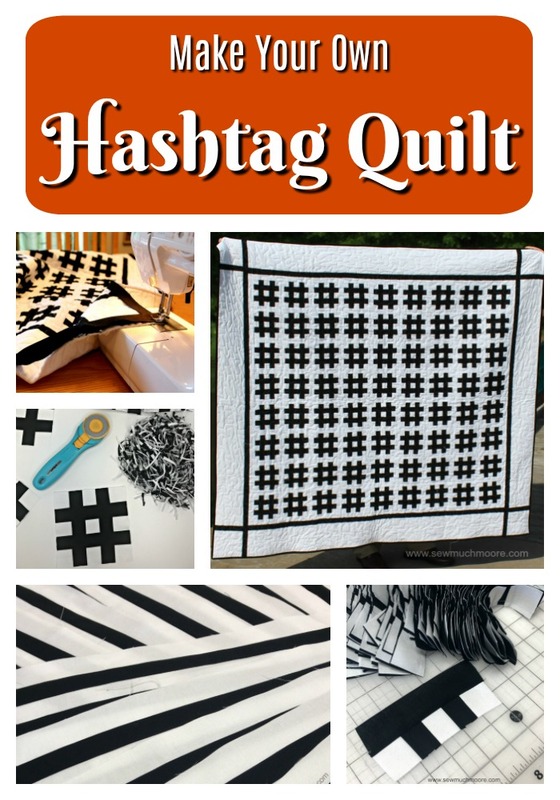 Be sure to show your completed Churn Dash Quilt Block in my FaceBook Group! 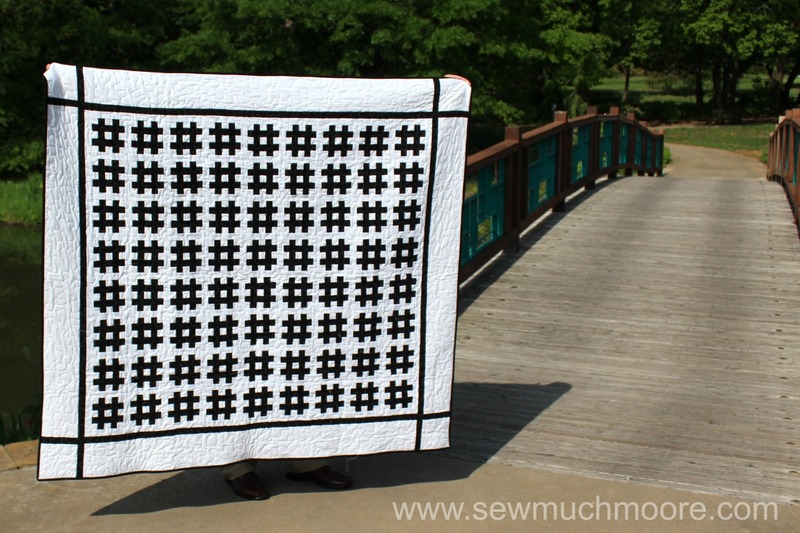 ps – If you can tell me the origin of this quilt block – I would soooooo appreciate it! 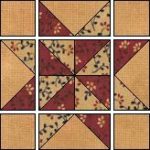 I could not find this in my research and love to know the history of quilt blocks! Comment below! 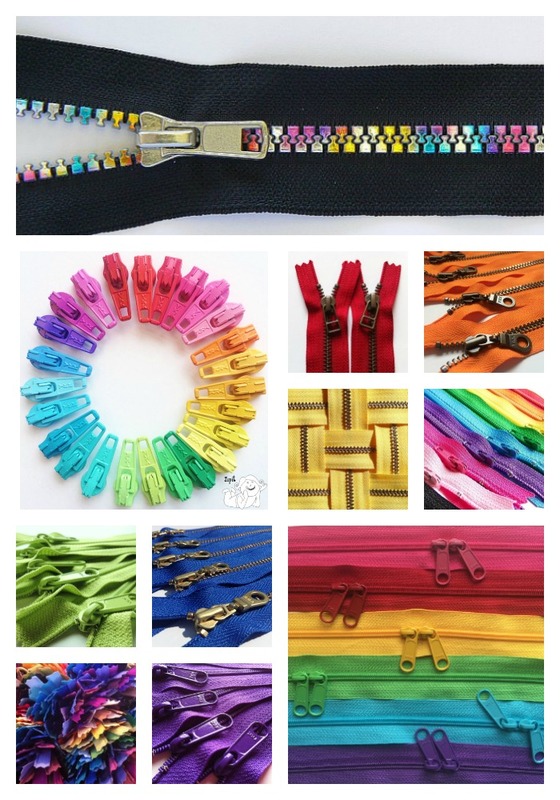 Lanyards are such a useful item to have and to make! 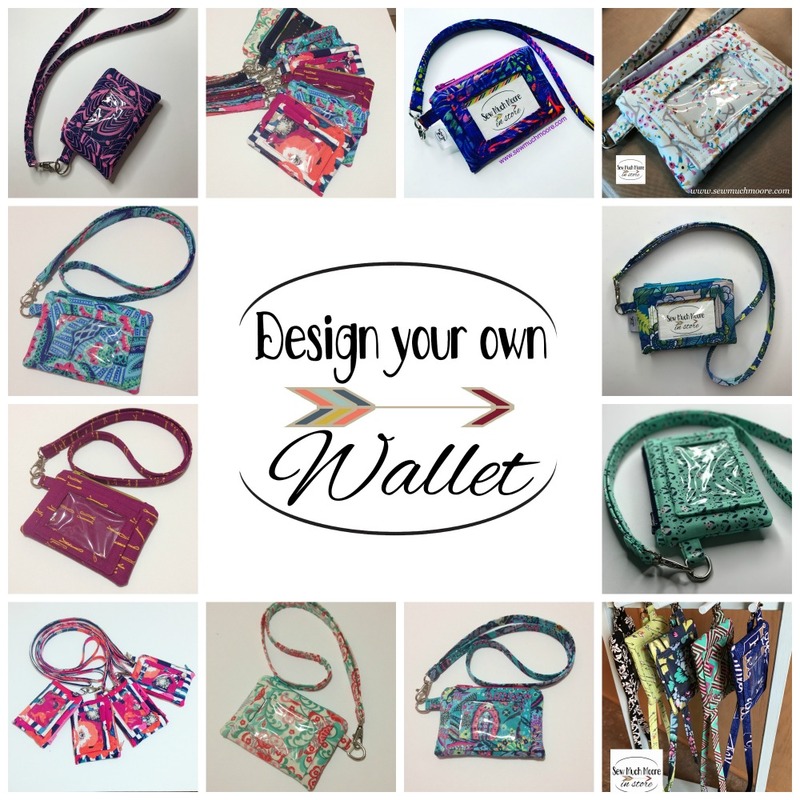 You can attach them to small wallets and hang around your neck (like the Kristine ID Wallet), or you can make a smaller version to use as a wristlet! I have even seen many people use lanyards as a key chain! Lanyards can make a fun and simple gift! Teachers LOVE them! One year, I gave all my kid’s teachers a lanyard and they were pleased as punch! 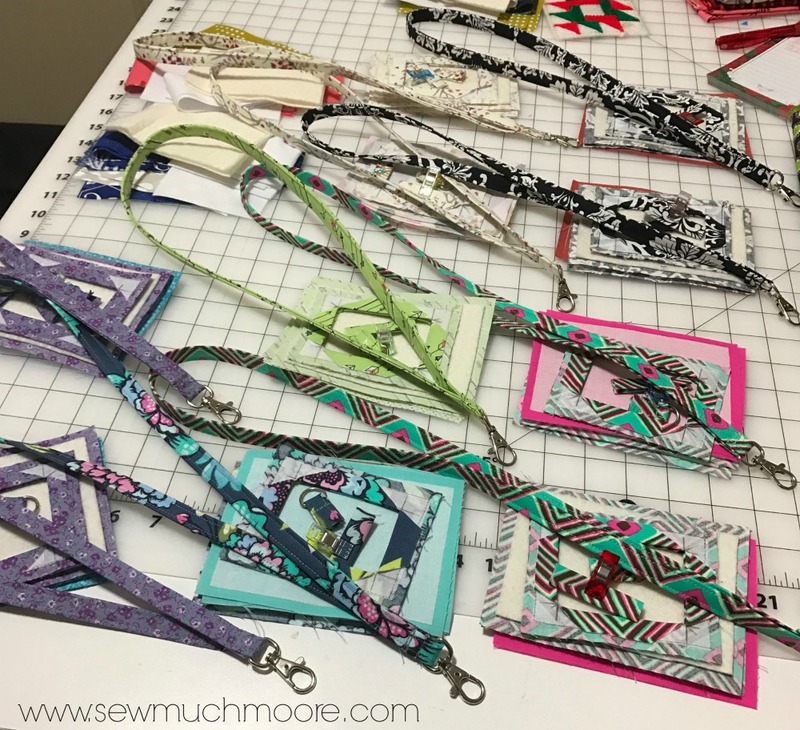 In this post, you will learn to make a lanyard, without having to use a Bias Tape Maker. Let’s get started and don’t forget to watch the video too! Be sure to leave a few inches at each end without any Shapeflex. This will make it easier to sew together at the end. 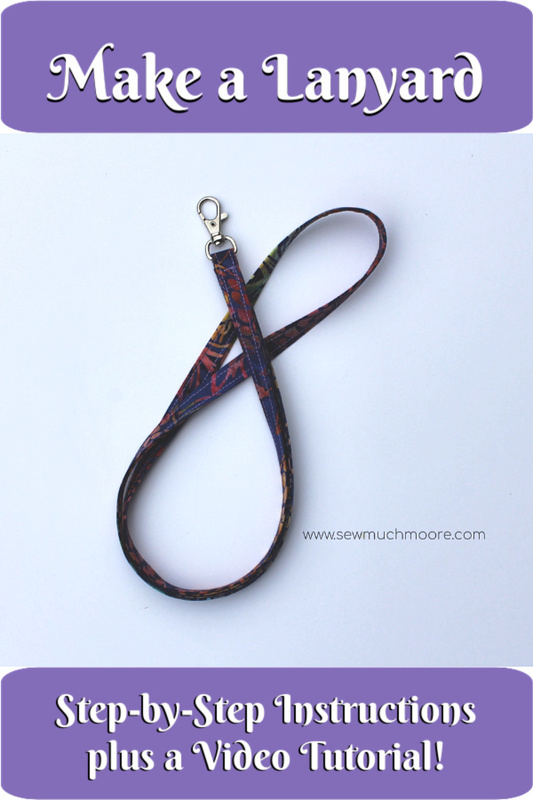 Fold and press the entire length of the fused Lanyard fabric in half (lengthwise) with wrong sides together. 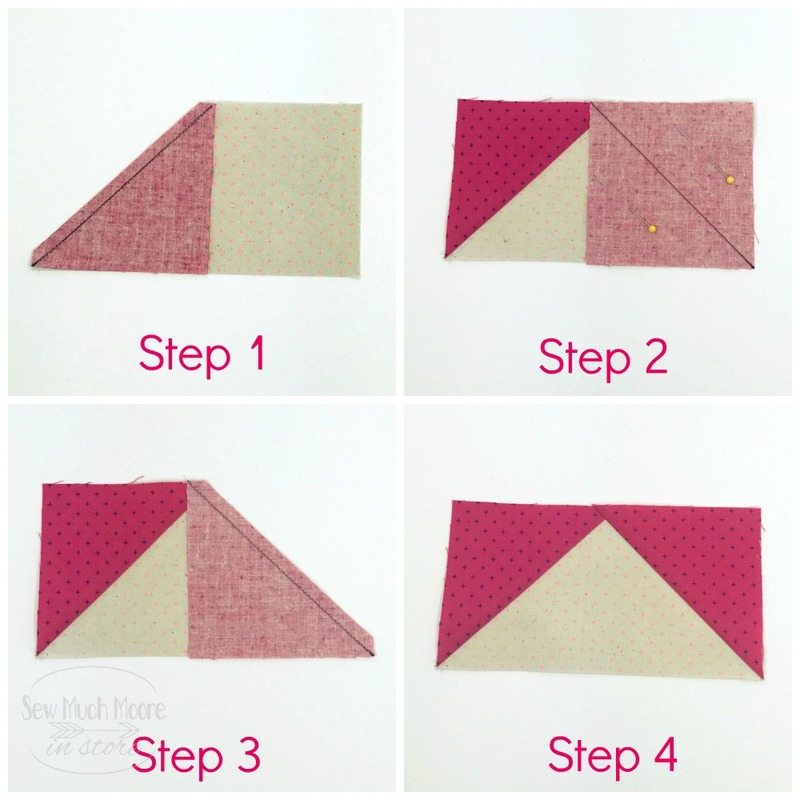 Open this fold and fold the long raw edged sides toward the middle crease and press. Straight stitch along the both edges (starting with the open side first). 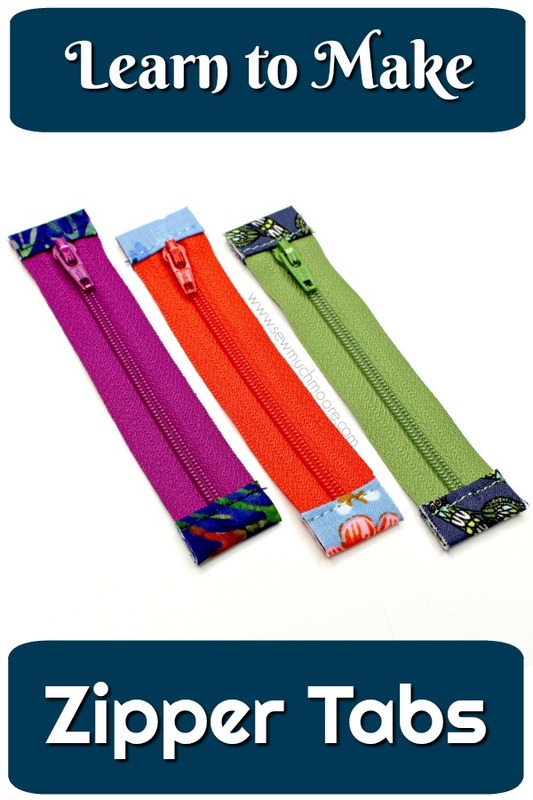 Use a longer stitch length when sewing your lanyard tape together. I use a 3.0 stitch length and it gives it a nice Top Stitch effect! 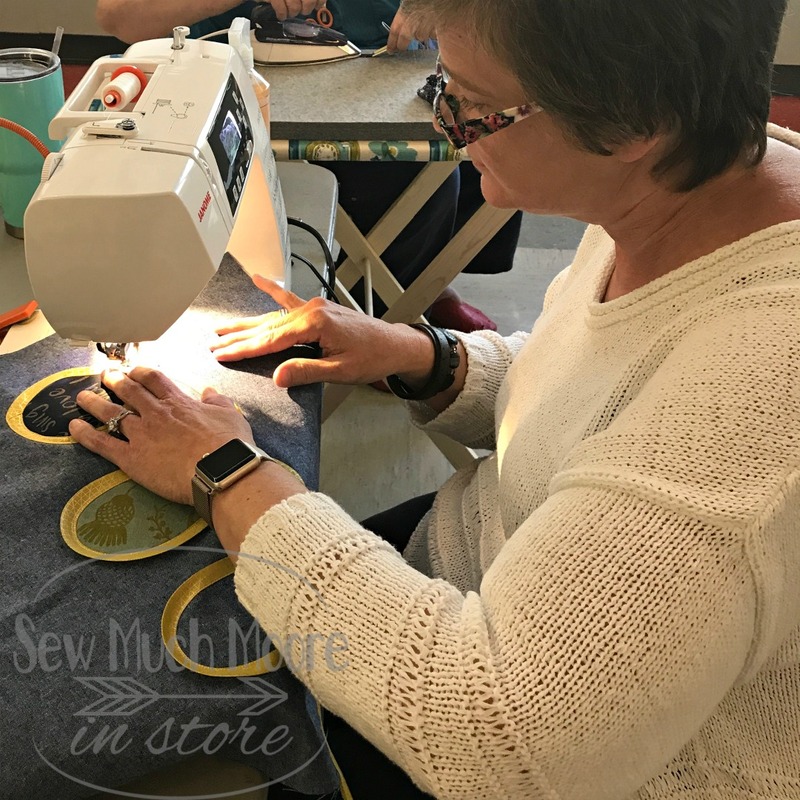 Use a thicker thread – I use Aurifil 40wt. I created a YouTube tutorial to help you learn to make your own lanyard. Enjoy! I hope you learned a lot from this tutorial. Don’t forget to subscribe to my YouTube Channel! I would love to know how you are going to use this technique in your next project. Are you going to make these for yourself or maybe as gifts? Let me know in the comments below! I just love my Airshow Mini Quilt! 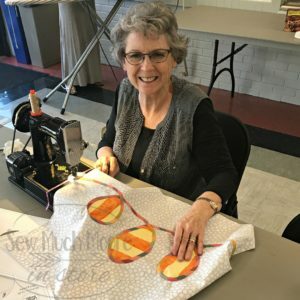 I took a Quilting Workshop, which was hosted by the Kansas City Modern Quilt Guild. The KCMQG was hosting Latifah Saafir, with Latifah Saafir Studios. This workshop featured the Airshow Quilt pattern. 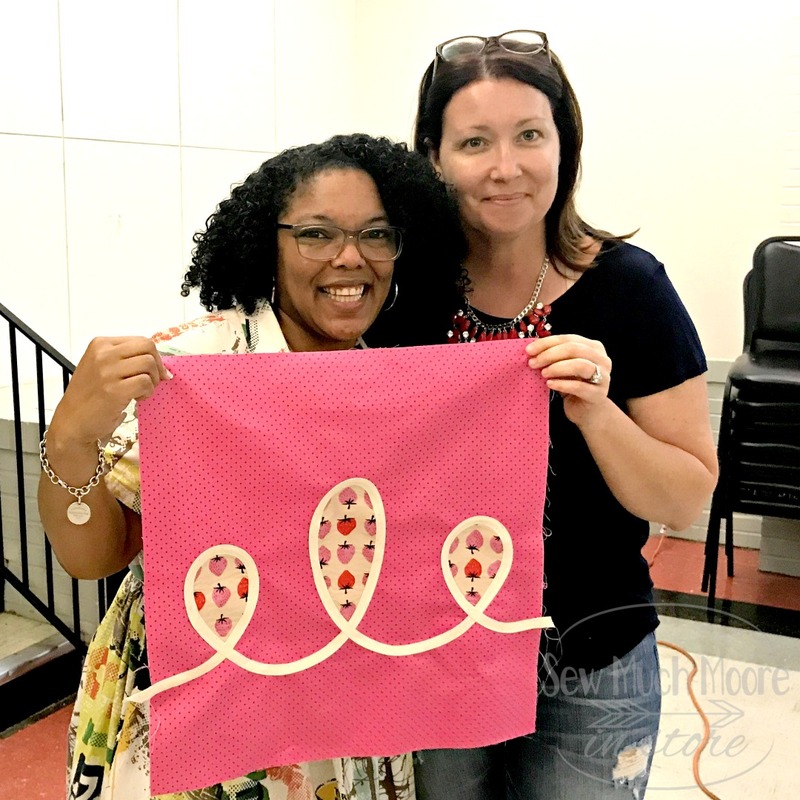 Because the workshop was a half day, all the class participants learned how to make a mini quilt (or a pillow top). 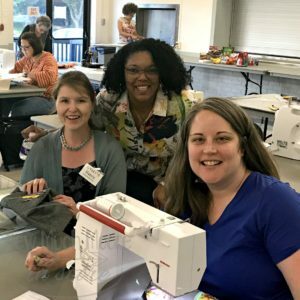 In this class we learned about Latifah’s pattern and some great tips and trick for working with bias tape. 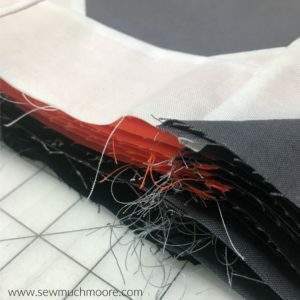 Let me share more about how I made my Airshow Mini Quilt. 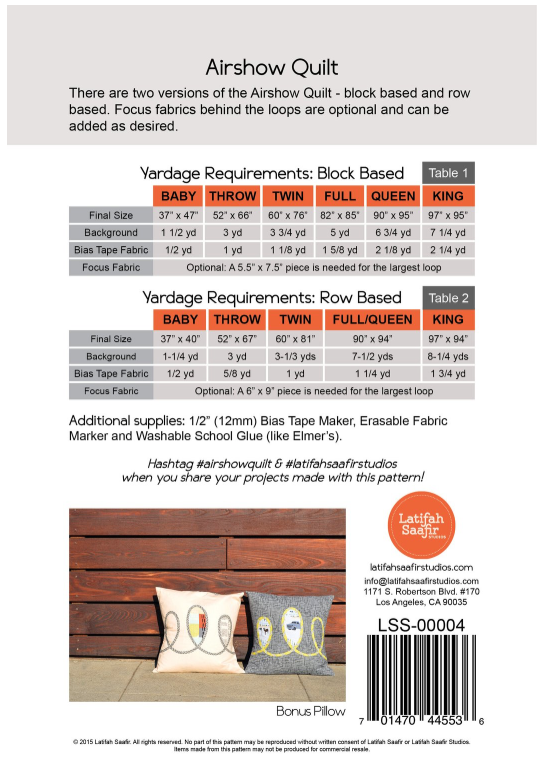 In case you wanted to make a different (larger size) of this amazing pattern, here is an image of what fabric amounts are required for each size. 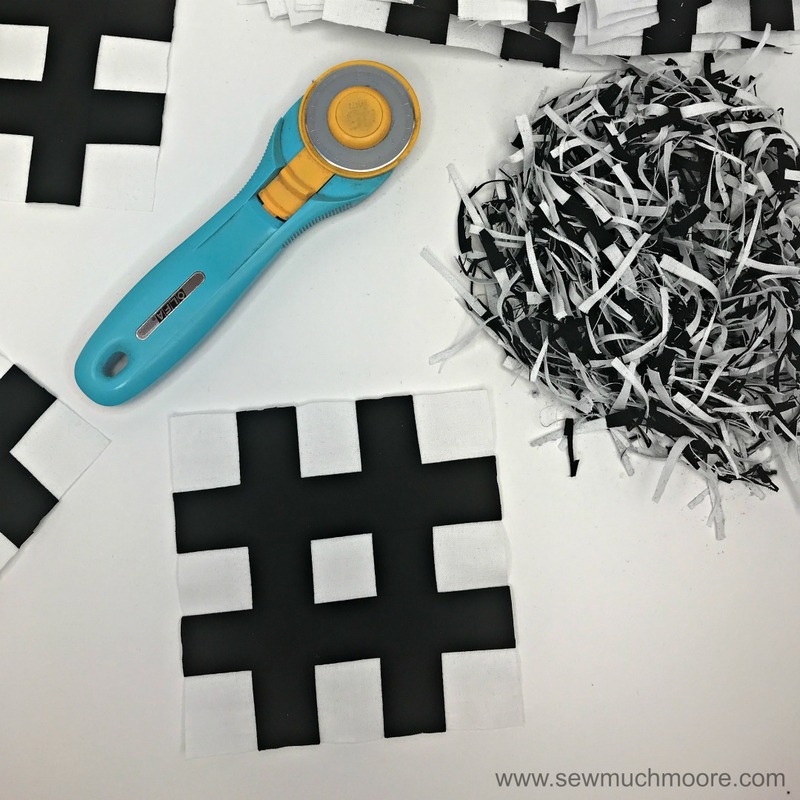 Using Latifah’s pattern, you will cut out your focus fabric and glue this to your background fabric. Be sure to use Latifah’s diagram to help you layout the pieces in the proper place. Then, using your Erasable Fabric Marker, you will trace and draw your loop lines. Make your bias tape and sew this over the lines. Super fun and easy! In case you haven’t made bias tape before, here is a helpful video tutorial! The entire class had a wonderful time making our Airshow Quilt Blocks! Check out some of these fun snapshots of the KCMQG Class! So many great varieties of fabric. 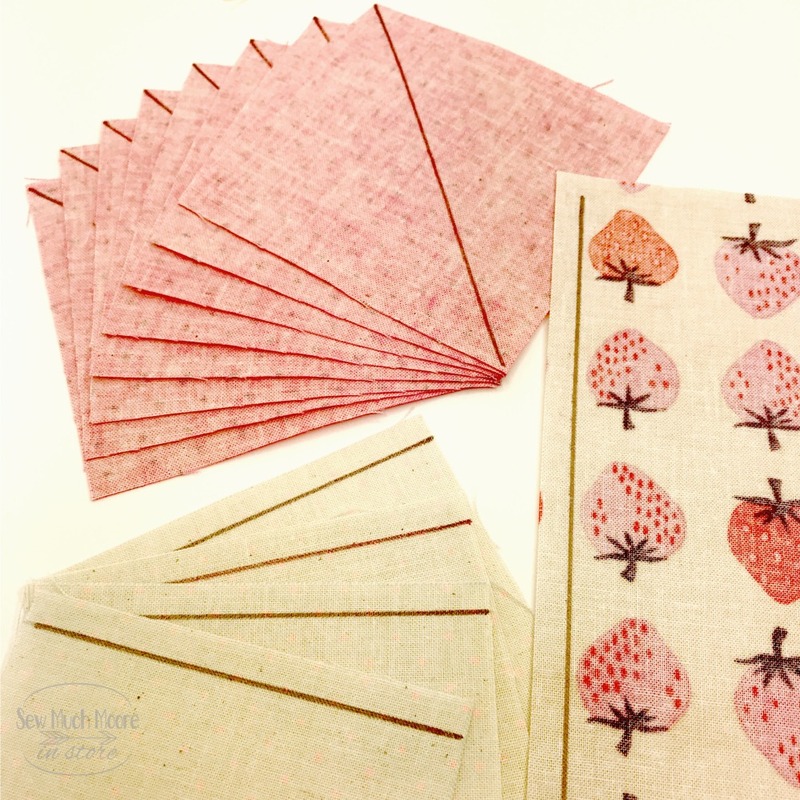 Isn’t it amazing how different these can look, just by selecting different fabrics? Say hello to some of my favorite people! 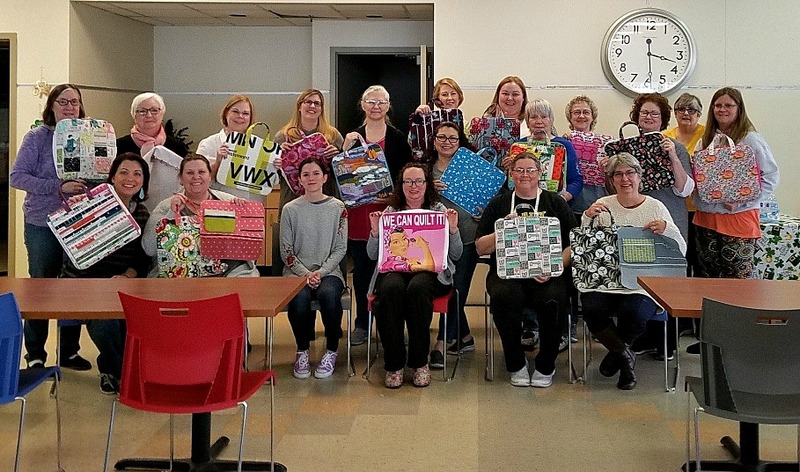 I just love the Kansas City Modern Quilt Guild! If you ever get a chance to take a class with Latifah Saafir, I highly recommend it! She is an excellent instructor and her style is amazing! You can learn more about Latifah on her website. If you belong to a guild, I would also recommend you make arrangements to have Latifah come for a visit! So much fun and inspiration! 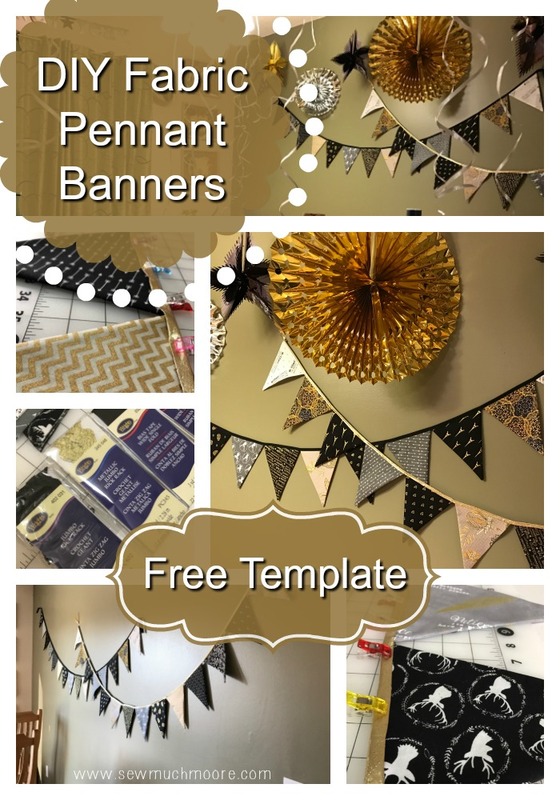 I hope you try this fun project! 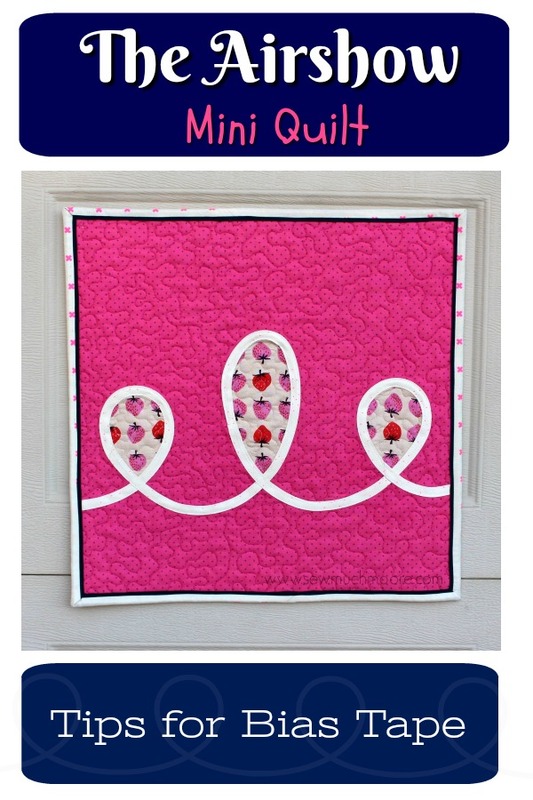 This Airshow Mini Quilt has found it’s place on my wall of mini quilts! Yay! 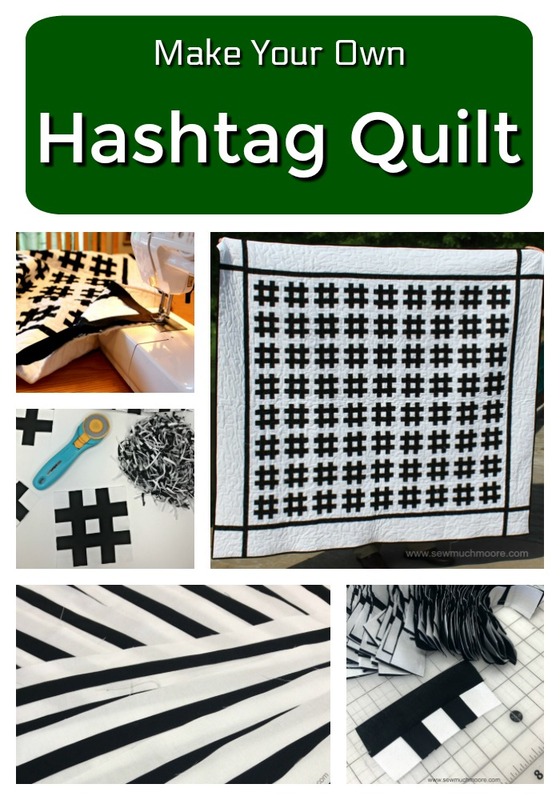 Check out these Quilty Posts! 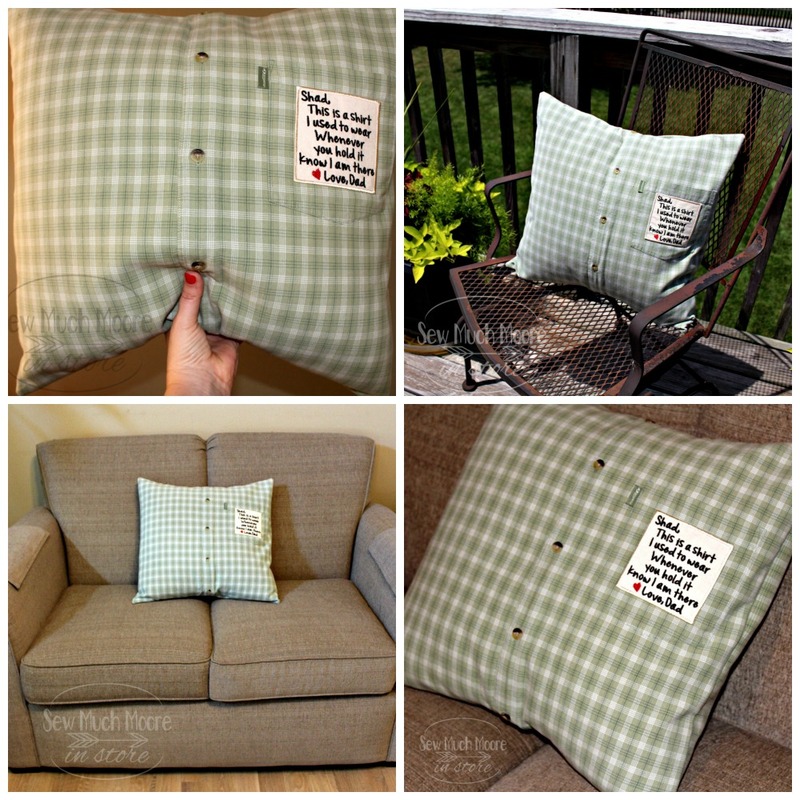 Have you ever wanted to take a piece of clothing and repurpose it into a pillow cover? When my Father passed away, we were not sure what to do with all his clothes. So many of what he wore reminded us of different days or events that we shared in his life. I wanted to take some items and find a way to keep a hold of his memory while utilizing his clothing in the process. 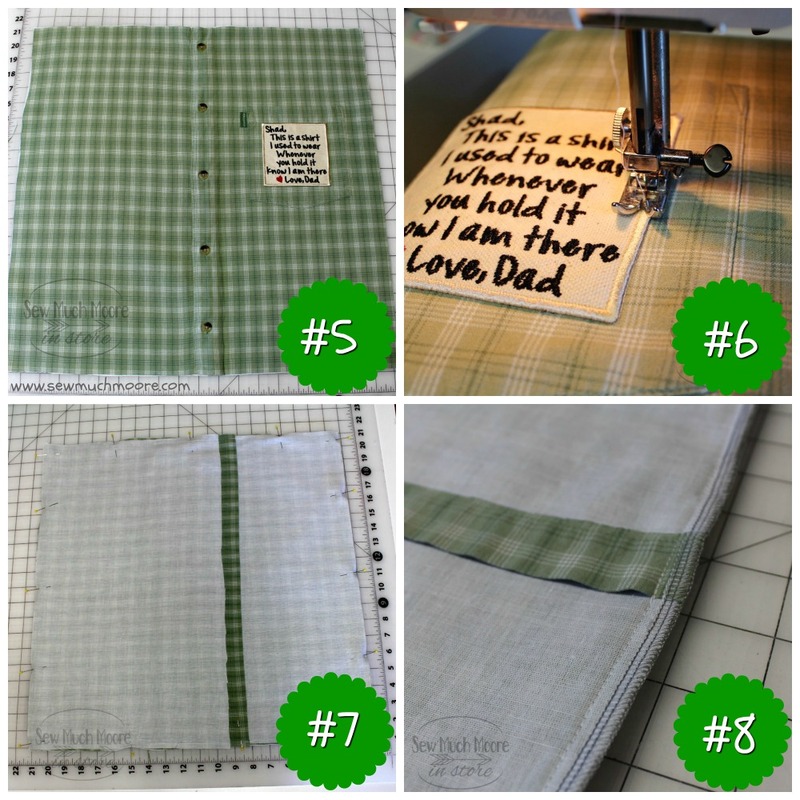 In this tutorial, I will show you how I took my Father’s button down shirt and repurposed it into a Memory Pillow to cherish for years to come! Let me show you how to make a Memory Pillow from a Men’s Shirt! My Dad’s shirt was a size XL, so that gave me a bigger pillow form option. Serger (not required, but recommended) I use the Brother 1034D. The size of your pillow cover is going to be limited to the size of your shirt. Measure the length and width of your shirt to determine the size of pillow form you can use. My shirt measured 30″ in length and 26″ in width. 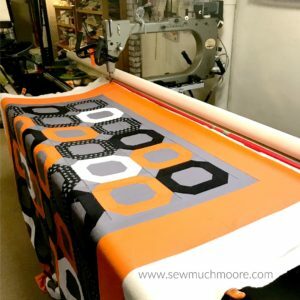 I had a 20″ x 20″ pillow form on hand – so that worked out great for this project! Before I cut the shirt apart, I buttoned the front of the shirt closed. Using my favorite fabric scissors, I cut the front of the shirt away from the collar and the back. I also omitted the sleeves. I cut the back away from the collar and sleeves as well. Then I used the following measurements when I cut apart my Dad’s shirt. 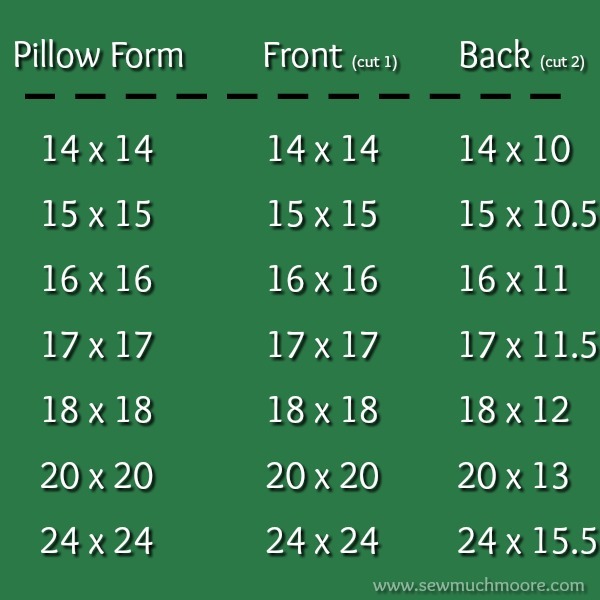 Again, my pillow form was 20 x 20, so I used the measurements listed on the below chart. Next, I followed these steps in assembling the pillow cover. Step 3 – Fuse the Shapeflex to the wrong side of both back pieces. 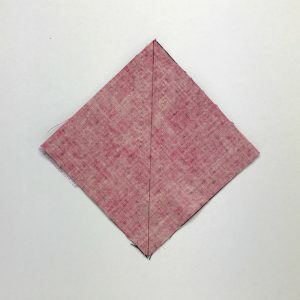 Fold a 1 inch hem on each side. Trip to size. Step 4 – Place one back piece on top of the other so that both hemmed edges will overlap. This is the envelope opening. 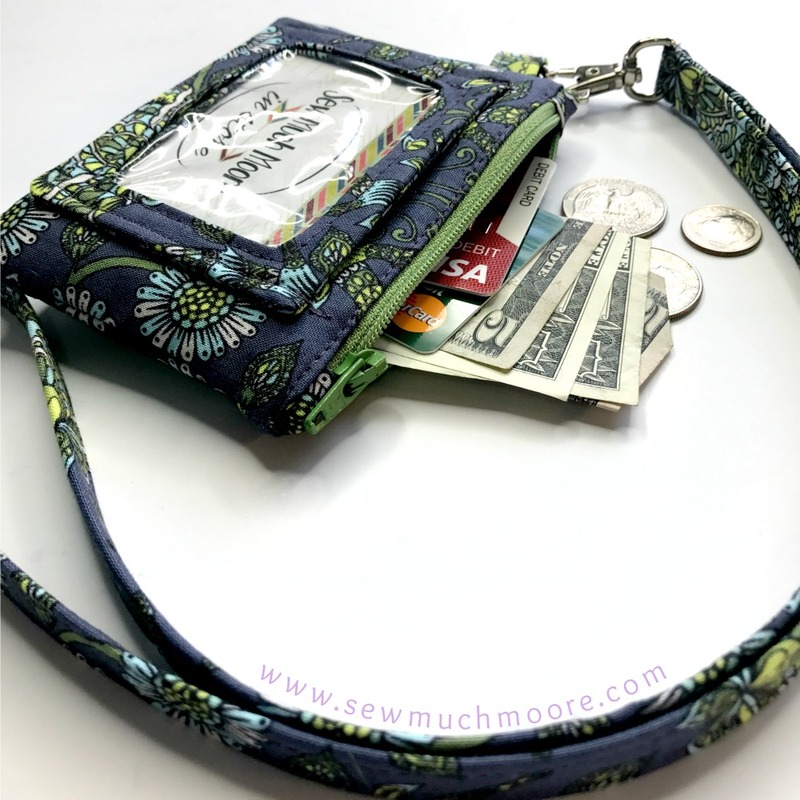 Secure with stitches along the bottom and top edge using a 1/4″ seam allowance. 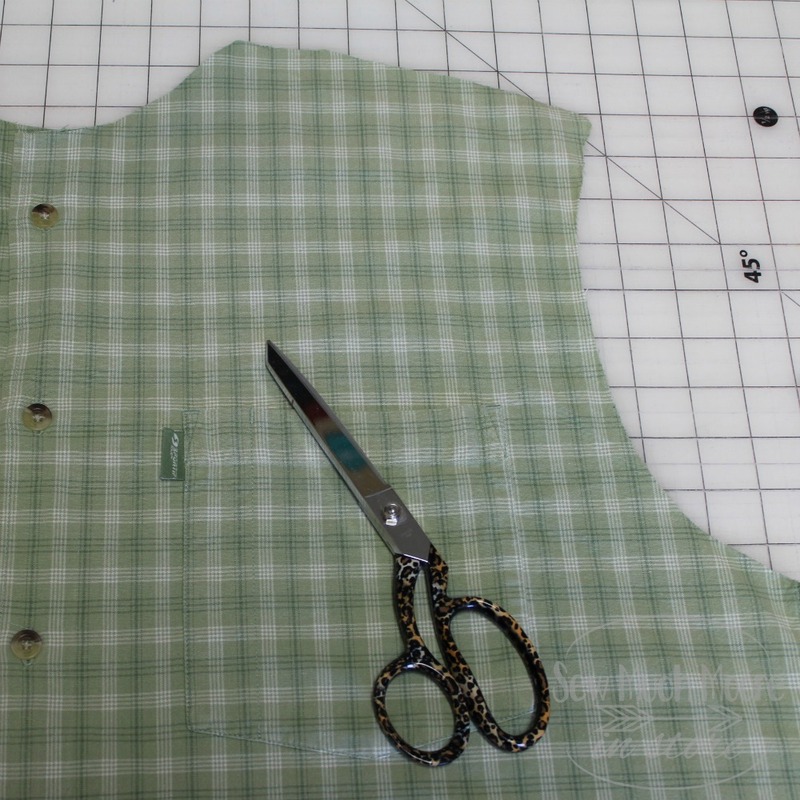 Step 6 – Sew the patch to the front of the shirt. This is optional (since the patch is technically iron-on). Step 7 – place the back assembled pieces on top of the front (right sides together). Pin along the edges. 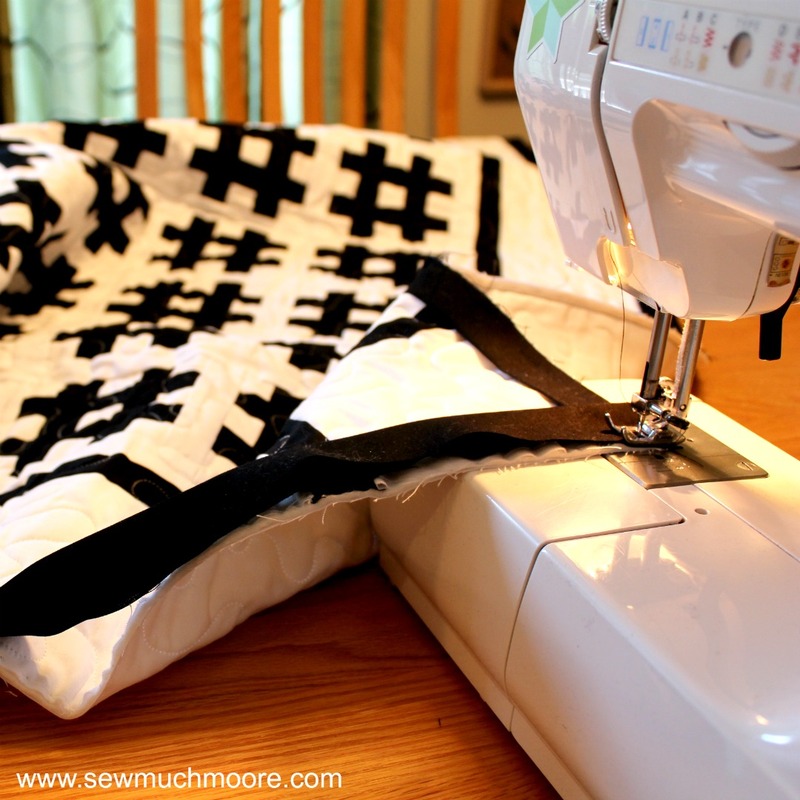 Step 8 – Sew the perimeter of the pillow cover, using a 1/2″ seam allowance. You can choose to serge this at the end. I think it adds a nice touch and finished the cover nicely! Now all you need to do is turn the cover right side out and install the pillow insert! Yay! This repurposed shirt is being gifted to my big brother. You guessed it, his name is Shad! You should make a Memory Pillow cover too! 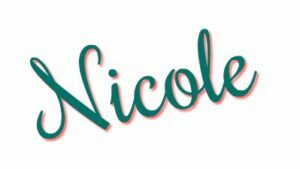 I have a fun giveaway to get you ready! 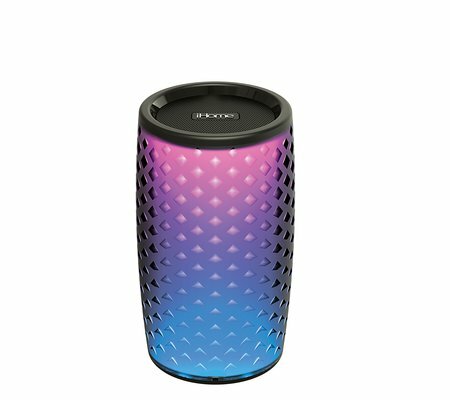 All you have to do is comment below and tell us what you plan to repurpose and you will automatically be entered into this random drawing. One lucky winner will receive one Custom created memory Patch from CR Creations Shop! 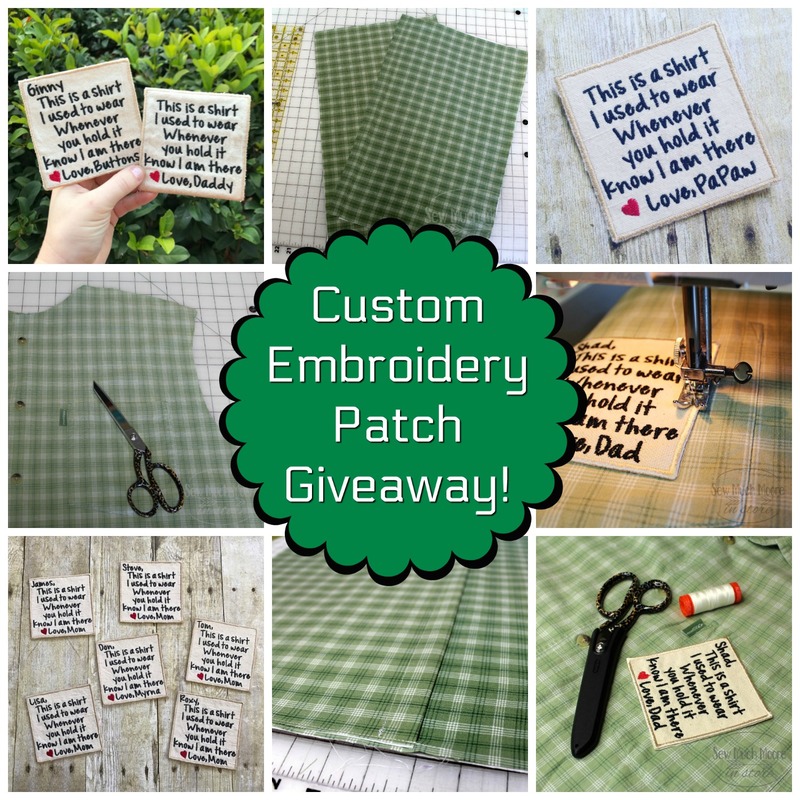 I will notify the lucky winner next week and get the custom embroidery details plus shipping info. You can comment multiple times to enter. Each new comment is an additional entry. You can even enter on my Instagram and Facebook comments! See my patch for all the contest rules. I can’t wait to hear what you have planned! Comment below! 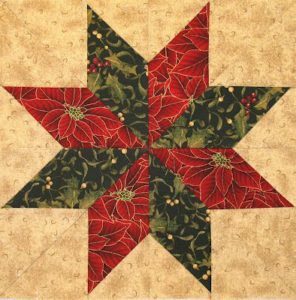 The Eight Point Star Quilt Block has many names! Some may call it the Evening Star Block, while others call it The Sawtooth Star Block. Whatever you decide to name your block it is certainly one that has stood the test of time. In this tutorial, I will show you how to construct this block by making Flying Geese units. Flying Geese can be considered a staple in the quilting world. There are many ways to make Flying Geese. 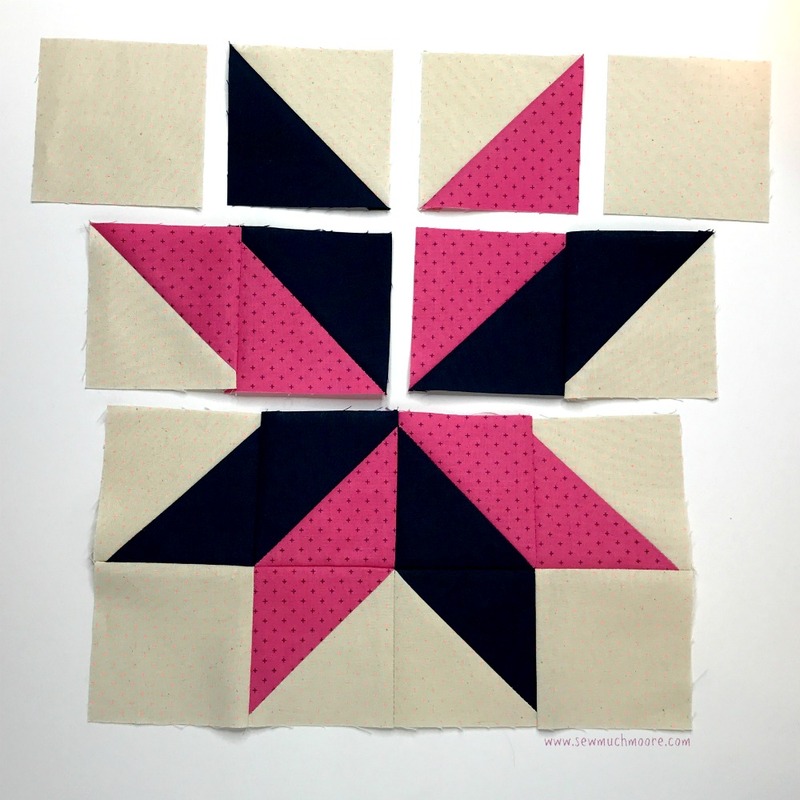 Let me show you one of my favorite Flying Geese techniques while making the Eight Point Star Quilt Block! 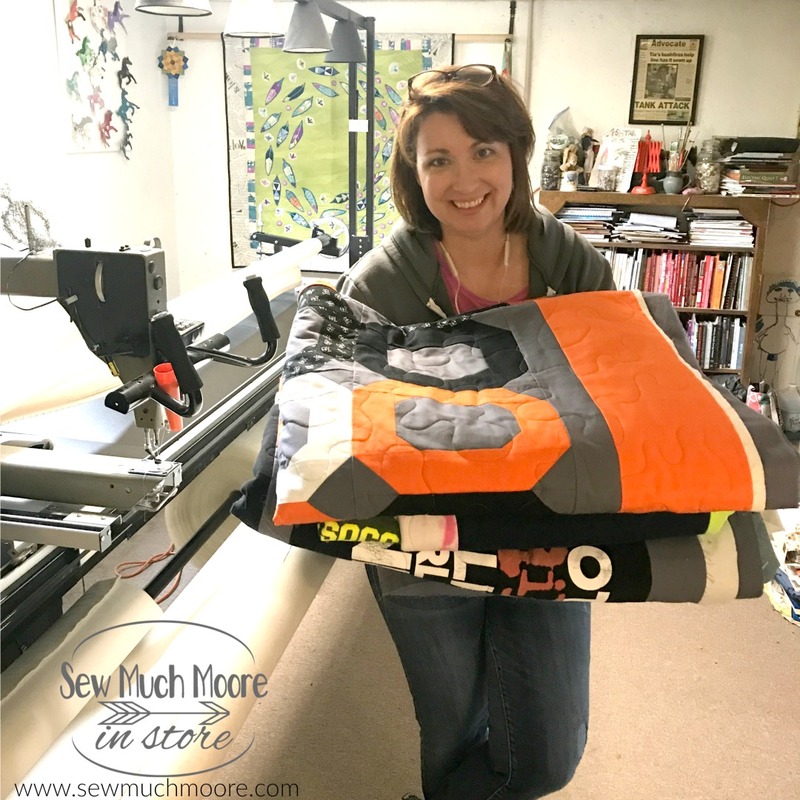 To download the cutting measurements for free, you can subscribe to the Sew Much Moore Newsletter. AFTER you sign up, you’ll get a confirmation email – and you have to confirm or my email service can’t send you the free pattern access email. But once you do confirm, you’ll get access to not just this but several other free patterns. Woot! 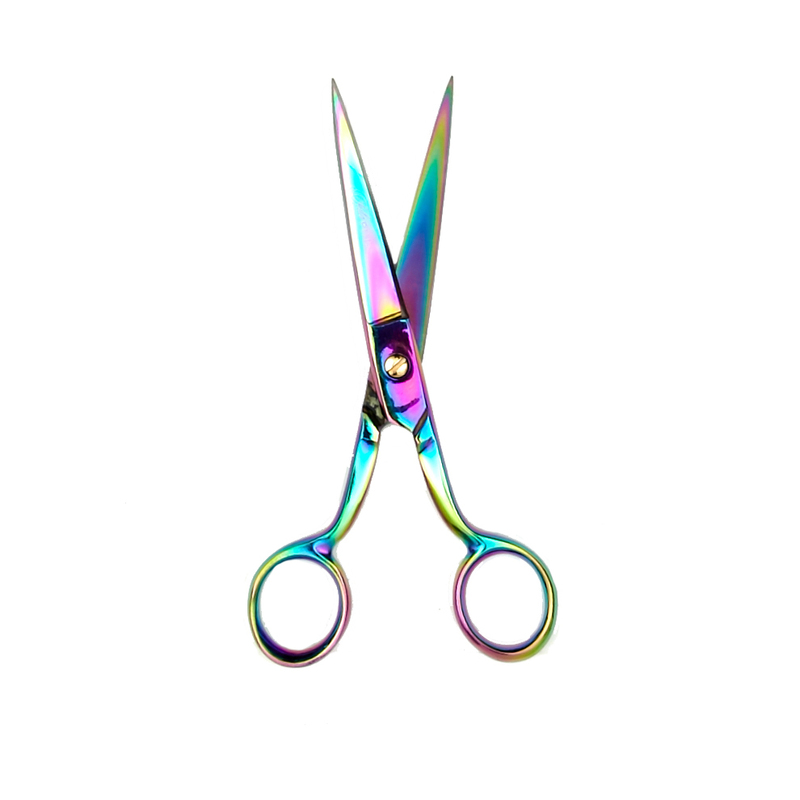 Use this link to purchase the cutting measurements file. 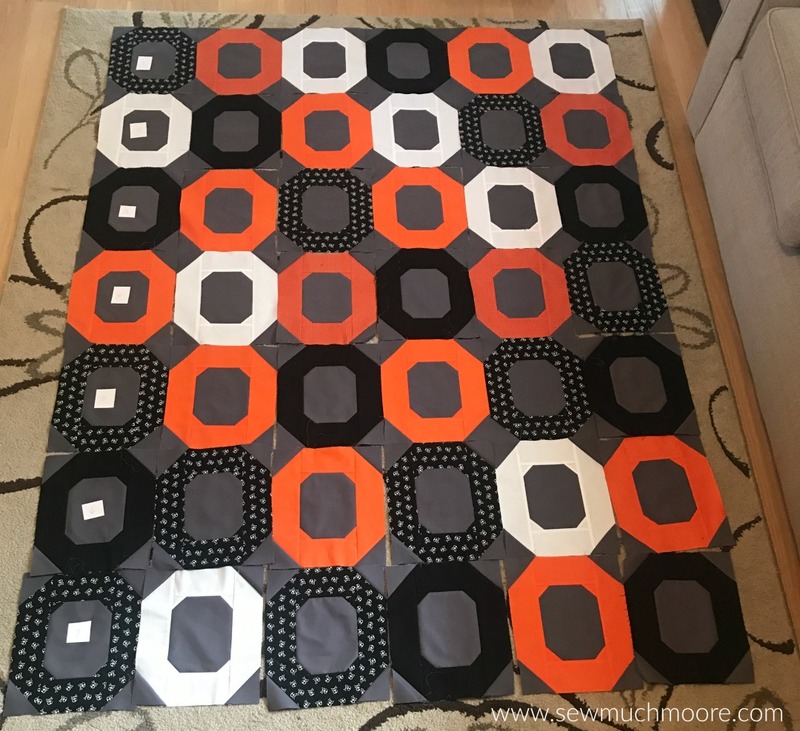 You’ll be emailed a download link for a file that references the instructions in this tutorial and provides the cutting measurements for this Quilt Block. You’ll also be able to download this file in my shop. Once you have your fabric pieces cut, follow the directions below. For really accurate piecing, I would recommend marking your sewing lines on your cut fabric pieces. 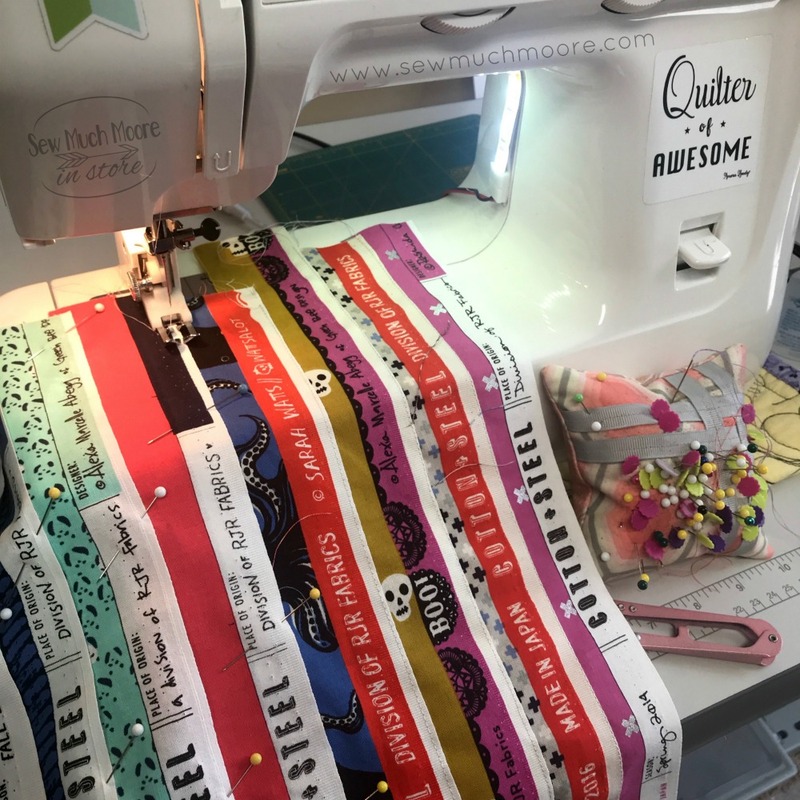 Marking your sewing lines can help you maintain your quarter inch seam allowance, which leads to excellent quilt blocks! One of my favorite marking tools are Frixon markers and pens. The ink in these pens and markers will disappear when pressed with a hot iron – They are super duper handy! Mark pieces (C) with a diagonal line. 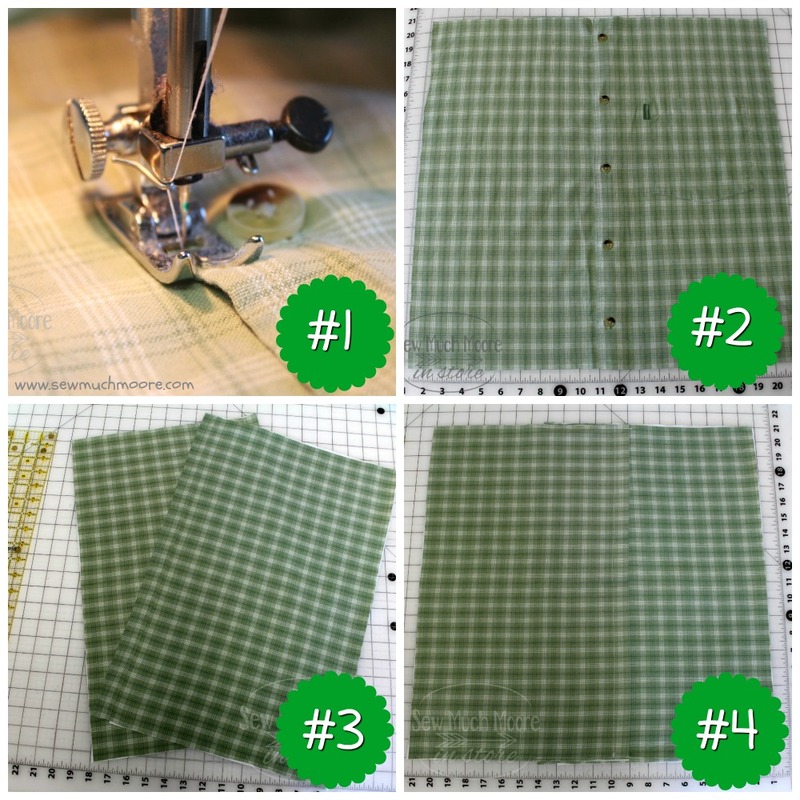 Then mark your quarter inch seam allowance sewing lines on your remaining fabric pieces (A, B, & D). Step One: Begin by laying piece (C) on the top and right side of a piece (B). Sew along the diagonal marked line. Cut off the excess fabric and set your seam with an iron. Open the seam and press. Step Two: Next, take another piece (C) and lay it on the top left side of the same piece (B). Sew along the diagonal marked line. 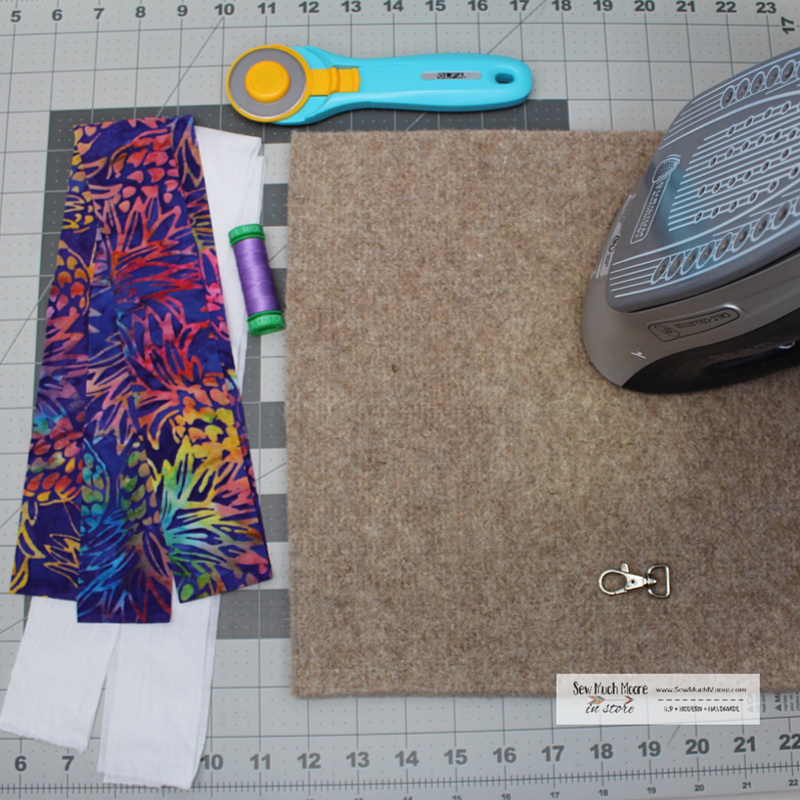 Step Three: Cut off the excess fabric and set your seam with an iron. Open the seam and press. Step Four: Make the other (3) Flying Geese units. Now that the Flying Geese units are all assembled, we just need to complete the rows. Using your marked quarter inch seam, sew the pieces (A) to both ends of 2 of the flying geese units. 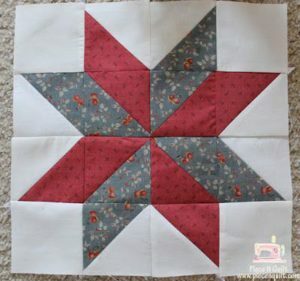 Sew the remaining two flying geese units to the center square. Be sure to press your seams in the opposite direction so you can easily nest your rows. Don’t you just love this block? I especially love this color combination! 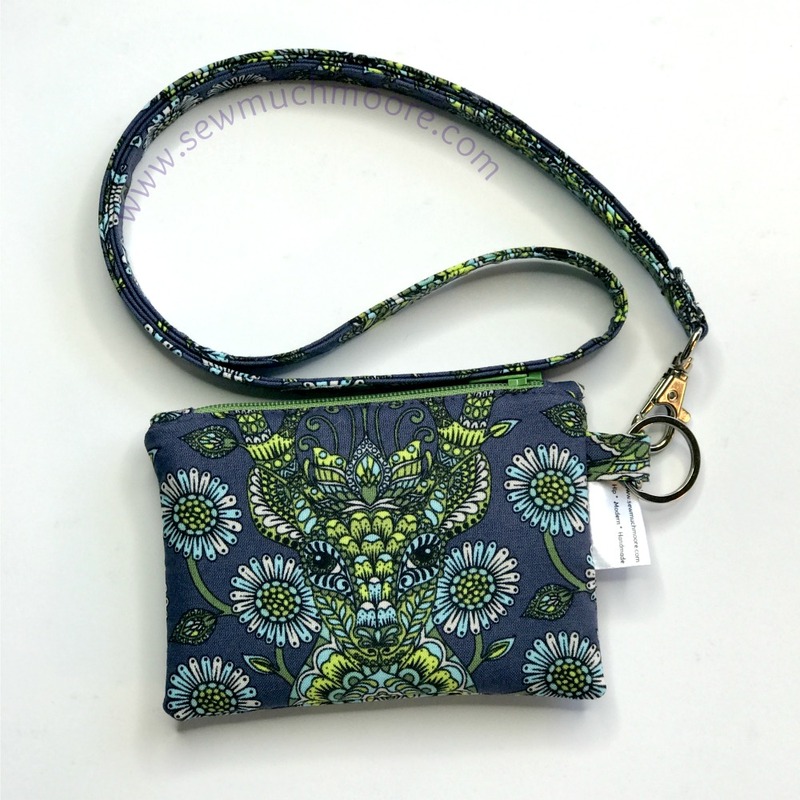 You could also use just one main fabric print for pieces C & D for a more traditional block. 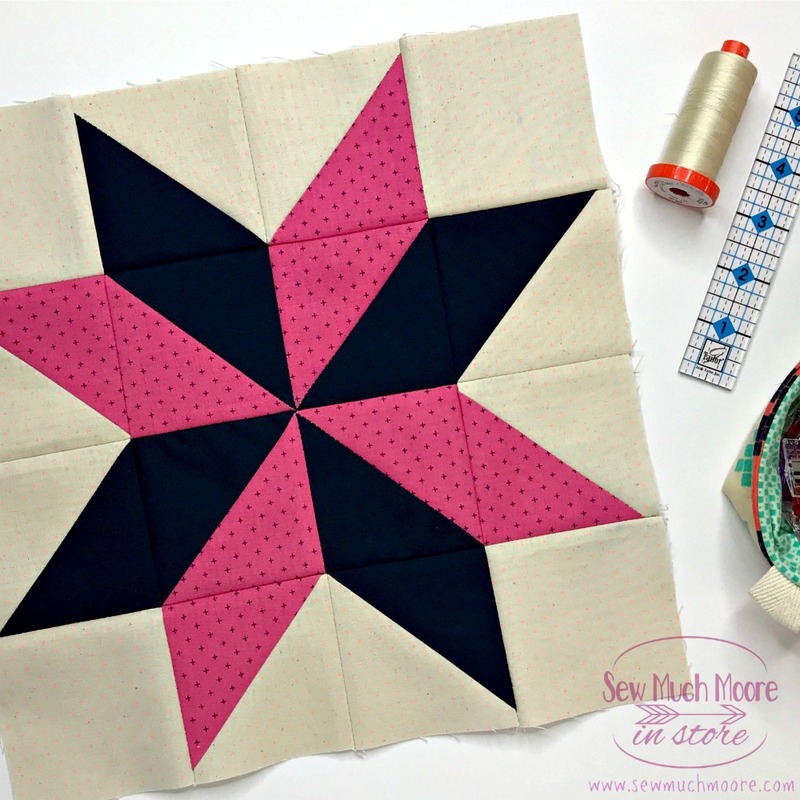 Either way – the Eight Point Star is a really fun and simple Quilt Block. I hope you make lots and lots of them! 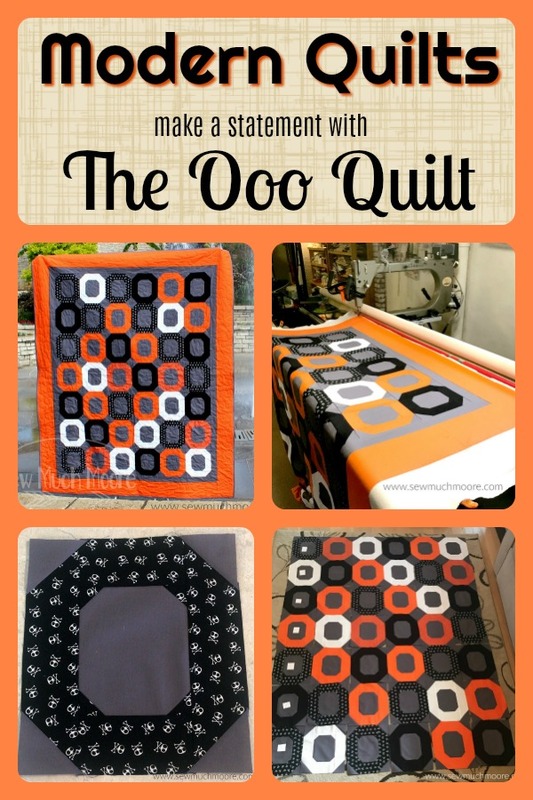 Happy Quilting and share this tutorial with your quilting friends! Be sure to check out these similar posts! 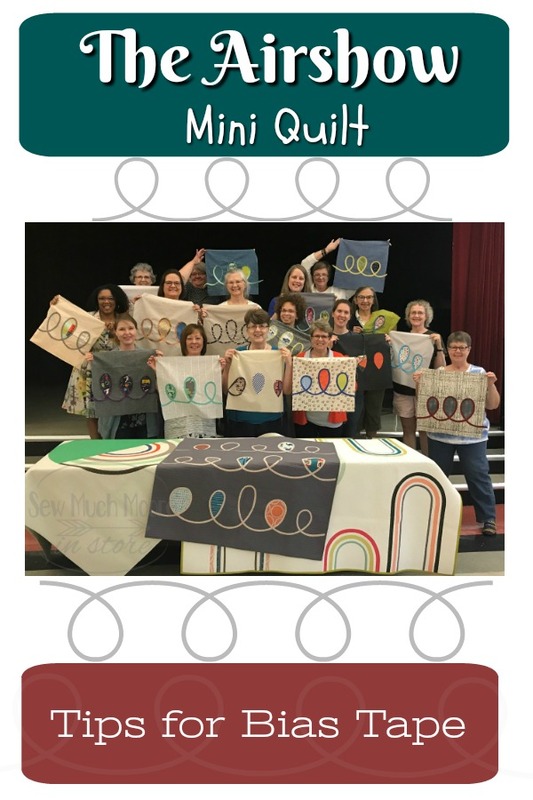 Being a member of a Modern Quilt Guild has it’s benefits! 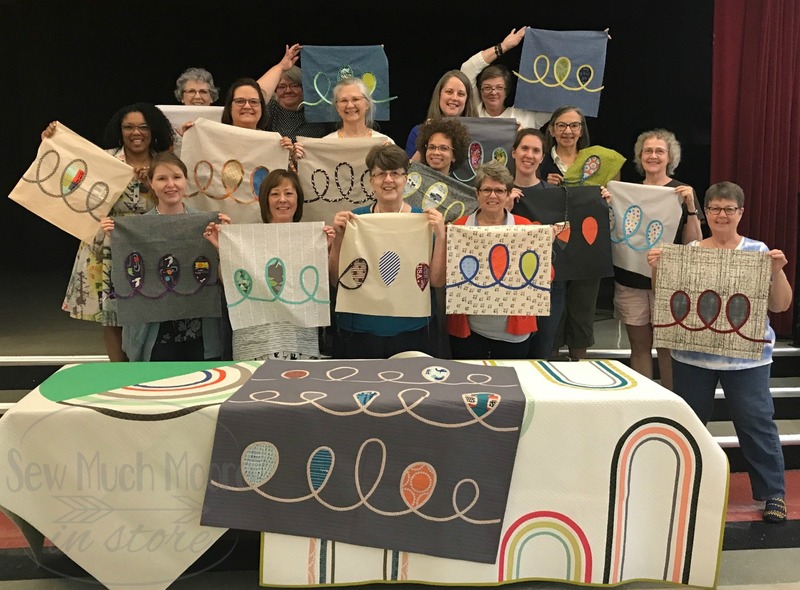 Our local Modern Guild, KCMQG, arranged to have Sara Lawson come for a lecture and workshop! Sara’s lecture was very informative and she even gave us each a swatch sample of many different kinds of interfacing. Sara’s workshop was sold out and all the attendees were excited (and some were a little nervous) about making the Amethyst Project Bag. Let me tell you all about it! 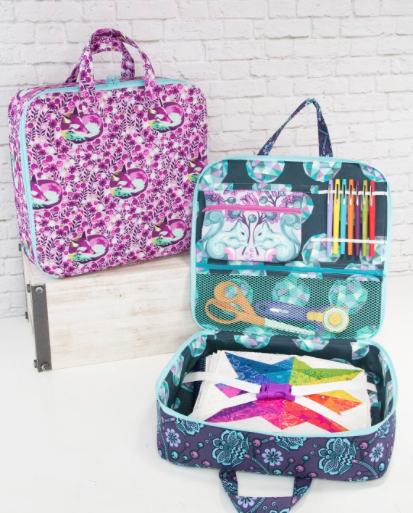 This bag features ample storage space for any project or hobby – quilting, drawing, hand-sewing, and so much more! 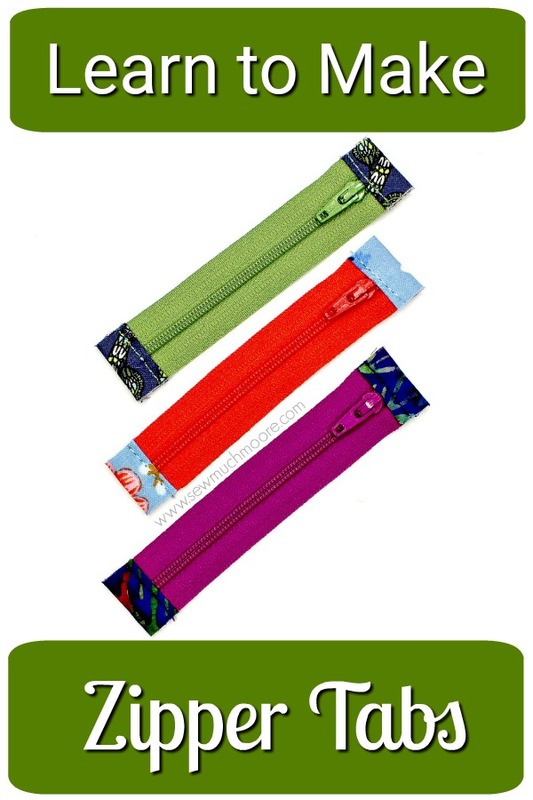 The lining features a zippered pouch, mesh zippered pocket, and elastics for holding pens or other items. The bottom of the case has an elastic buckle strap to hold quilt blocks, books, and rulers. I plan to put some current UFO’s in mine and easily take it to a Sew Day or Quilting Retreat! Let me tell you what you will need to make your own! 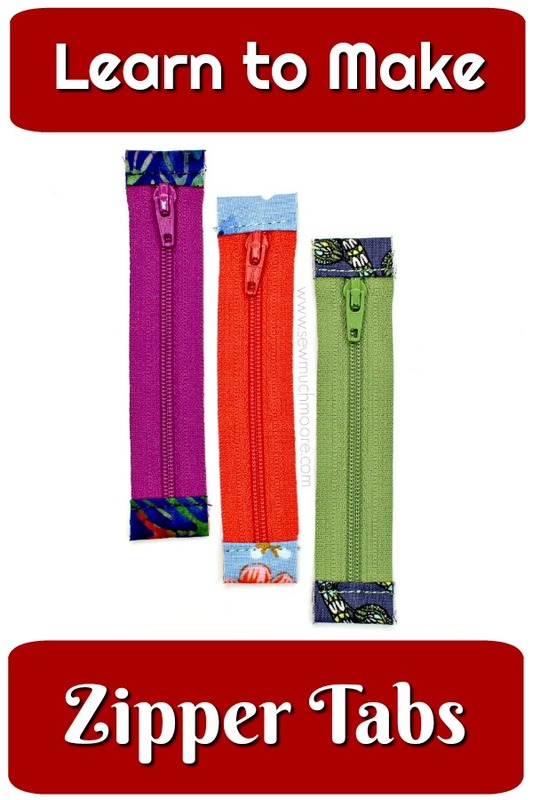 Plastic side-release/parachute buckle (it should be able to accomodate 1” wide strap) – check out the color choices here. As I mentioned above, we constructed this bag in a workshop. There were close to 20 of us gathered together. 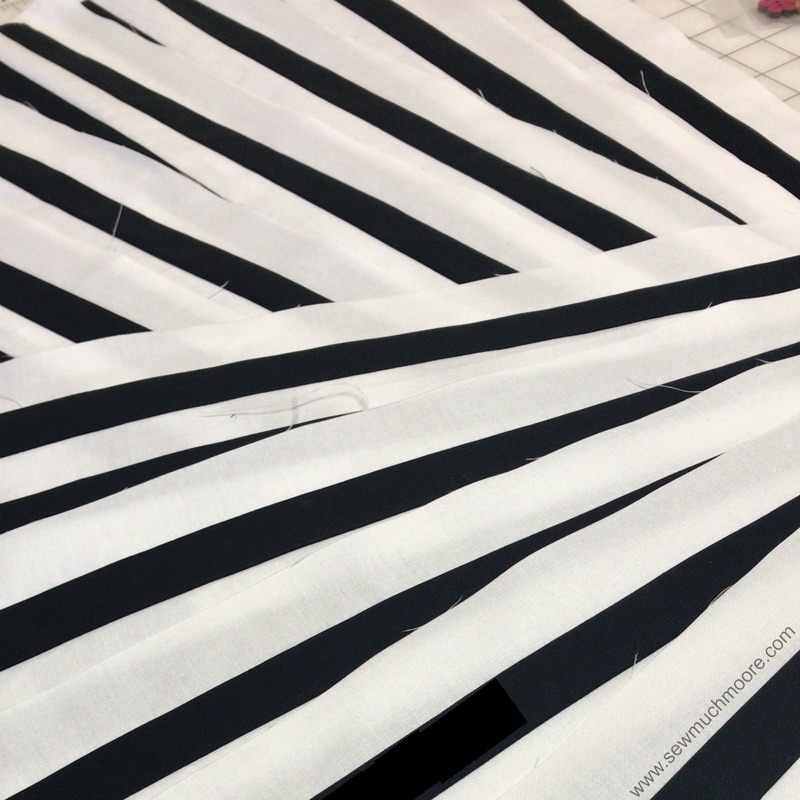 Prior to class, we were instructed to pre-cut and fuse all our fabrics. 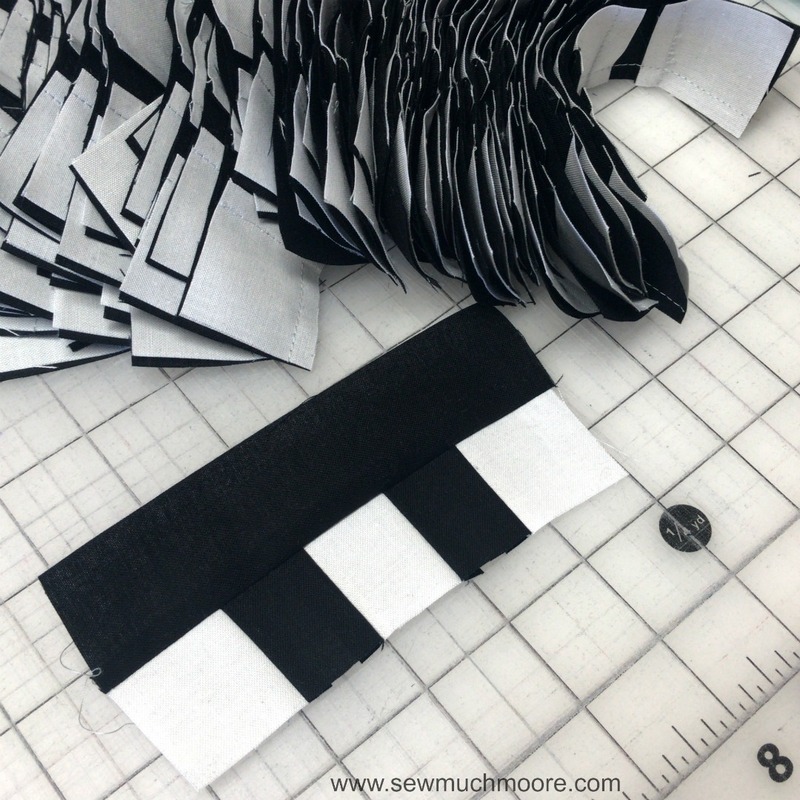 I had a tough time figuring out what fabric to use for my exterior, so I decided to sew a bunch of my saved selvages together to create my own exterior fabric! 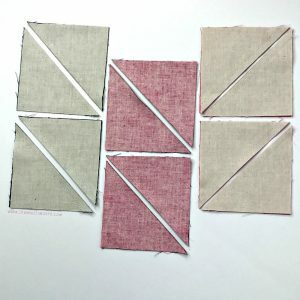 Do you save your Fabric Selvage too? Can’t you tell that I’m obsessed with Cotton + Steel? Again – I’m loving these Cotton + Steel prints from a few years back. It’s so nice so sew from my stash! 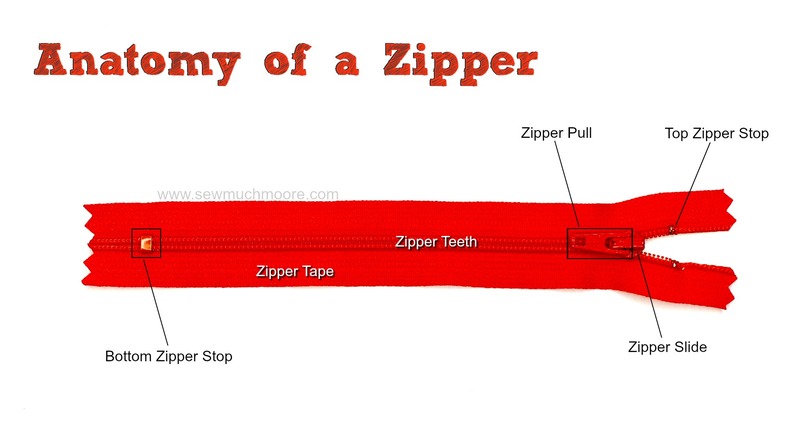 I think the most challenging part of the pattern is fitting the long zipper around the bag. Sara to the rescue!!!! Thanks for all your help, Sara! 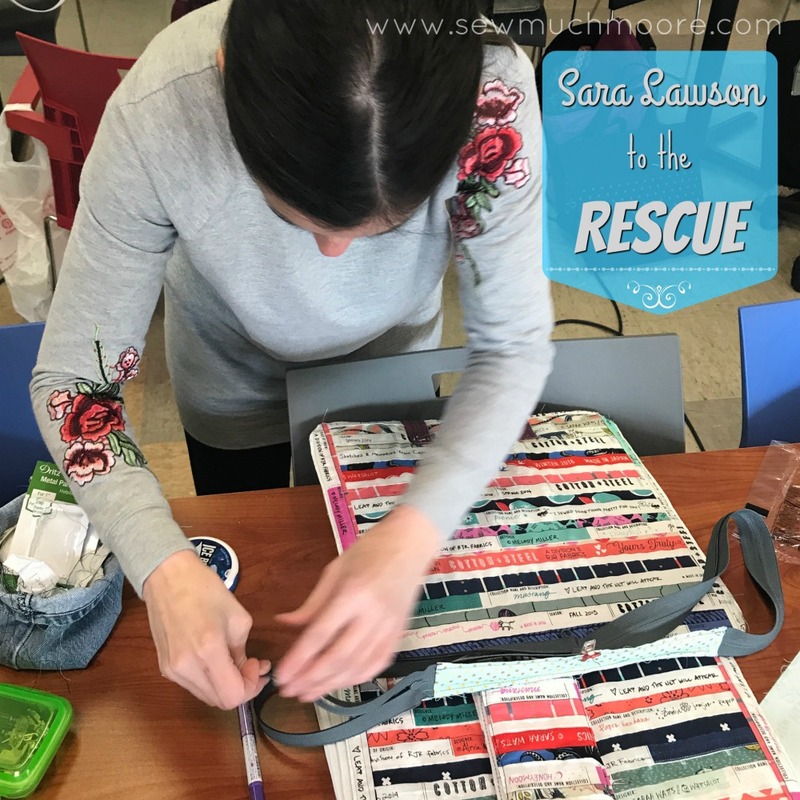 If you ever have the opportunity to host Sara at your local guild, you will definitely want to also book a workshop. We all had such a great time and Sara is a wonderful instructor! Sara also explains this pattern in a video. She takes you through the pattern (step-by-step) and helps you finish! Check out this little trailer that explains her instruction video. You can learn more about getting her full video (over 2 hours of instruction) right HERE. Several of us finished and most of us were REALLY close to finishing. Whenever I take a class, I am usually a Chatty Cathy and finish mine after the class is over. 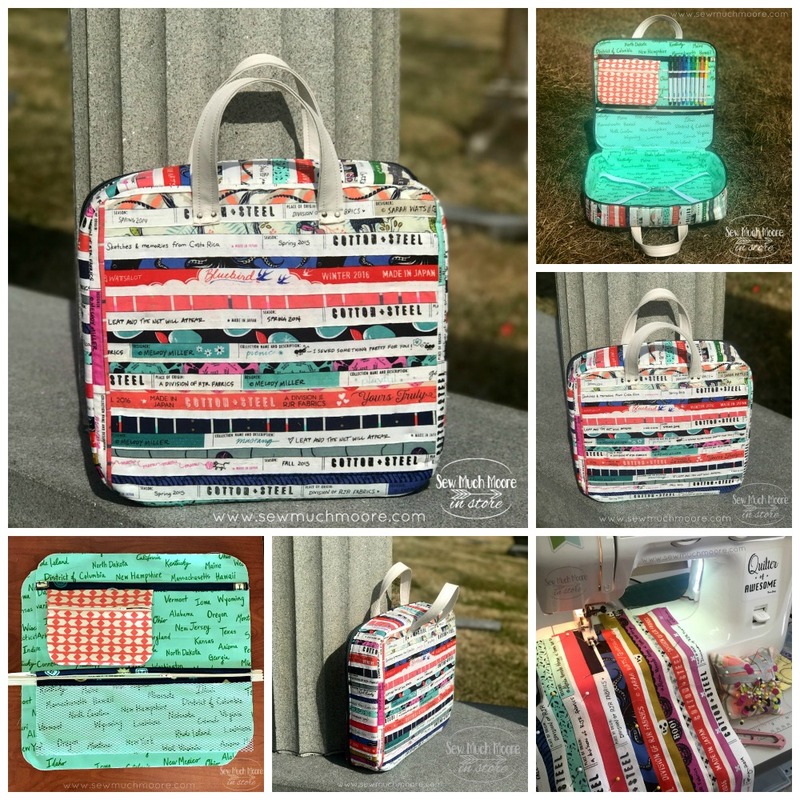 Amethyst Project Bag – all finished!!! I really love how my Amethyst Project Bag turned out! Update (one year later): I still use this useful bag! It currently holds my “forever” UFO. 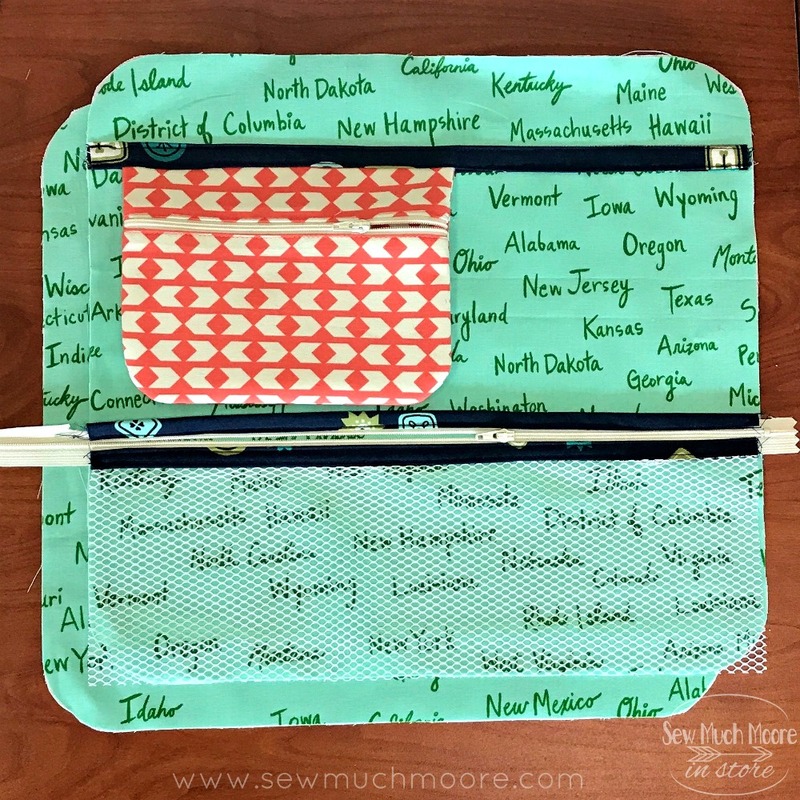 I take it with me to sewing retreats so that I can be sure to work on it each time. And who can resist a group photo!???!! I hope you take some time and enjoy this fun pattern!